Introduction: Obesity in pregnancy has been associated with adverse pregnancy outcomes. In this study, we estimate the prevalence of early pregnancy obesity and the impact on materno-fetal outcomes. Materials and Methods: A cohort of 176 pregnant women were purposively recruited before 20 weeks. Women <18 years, with multiple pregnancies or chronic medical conditions, were excluded from the study. Body mass index (BMI) grouping was done at the first clinic. Data were presented as means (standard deviation) and proportions and differences compared using Chi-square or ANOVA. Results: Early pregnancy weight of 173 women followed up from booking to delivery showed 41.2%, 24.3%, and 32.2% were normal weight, overweight, and obese, respectively. At recruitment, the mean age, mean BMI, and mean gestational age were 31.7 ± 4.4 years, 27.1 ± 5.3 kg/m2, and 14.4 ± 3.2 weeks, respectively. Compared to normal weight women, the obese were older (31.1 ± 4.0 vs. 32.8 ± 4.1, P = 0.06) and of higher parity >2 (19.2% vs. 36.9%, P = 0.17). Compared to those with normal BMI, occurrence of gestational diabetes mellitus (1.3% vs. 10.53%) and preeclampsia (6.9% vs. 14.0%) were more in obese women whereas overweight women had higher occurrence of pregnancy-induced hypertension (6.9% vs. 16.3%) and preeclampsia (6.9% vs. 13.95%). At delivery, compared to normal weight, obese women had more cesareans (57.5% vs. 69.7%), more deliveries <37 weeks (20.6% vs. 41.07%), more babies <2.5 kg (13.7% vs. 25.0%), acrosomic (9.6% vs. 12.5%), and more special care baby unit admissions (4.1% vs. 10.7%). Conclusion: Even in low-resource setting, obesity in pregnancy is not uncommon. Affected women would benefit from prepregnancy interventions. Keywords: Body mass index; obesity; outcomes; pregnancy. Most of the studies on obesity in pregnancy revealed that these adverse effects on materno-fetal outcomes were conducted in high/middle-income countries.,,,,,, These have resulted in the development of various guidelines aimed at preventing these adverse outcomes in obese pregnant women tailored to that environment. An example is the 2009 guideline by the US Institute for Medicine about modifiable factors such as prepregnancy weight and gestational weight gain. In contrast, in African societies, known more for poverty, disease, and undernutrition, obesity in pregnancy has not received much attention, even though these countries have also reported an increasing prevalence of obesity recently.,,, However, studies in these low-resource environments, such as Nigeria are also necessary and will help in the development of context relevant guidelines. Thus, this study aimed to estimate the prevalence of early pregnancy obesity and evaluate the impact of the early pregnancy body mass index (BMI) on materno-fetal outcomes among pregnant women at the University College Hospital, Ibadan. It is hoped that findings from this study will contribute to the body of knowledge in drawing up strategies for the prevention and management of obesity in pregnancy in low-resource settings. This was an analytical study of a cohort of pregnant women who were recruited from the first antenatal clinic visit and followed up till delivery. Data on early pregnancy weight were obtained, and the impact on pregnancy outcome was analyzed. The study was conducted in the antenatal clinic of the hospital. The hospital is an 880-bedded hospital located in an urban area of Ibadan. Ibadan has a population of 3.8 million. The hospital receives referrals from the environs. The antenatal clinic runs four times a week (Mondays to Thursdays). On Wednesdays, only new patients presenting for registration are attended to. Consenting pregnant women, below 20 weeks gestation, desiring to have their delivery in the hospital were included in the study. Women <18 years of age, short-statured (<1.48 m), or with multiple pregnancies, or chronic medical conditions were excluded from the study. The sample size was determined using the formula: N = (Zα / 2)2o2/ Δ2. Where, N = the desired sample size, Zα/2 = the standard normal deviate corresponding to a level of significance of 0.05: 1.96, O = the standard deviation of mean neonatal birth weight: 580 g, and Δ = the accuracy estimate: 90 g was chosen as the upper limit of the error of estimation. Applying the formula above, the desired sample size is: N = (1.96)2 5802/(90)2, N = 160. A 10% increase was included to account for attrition due to loss to follow-up. This took the total sample size to 176. 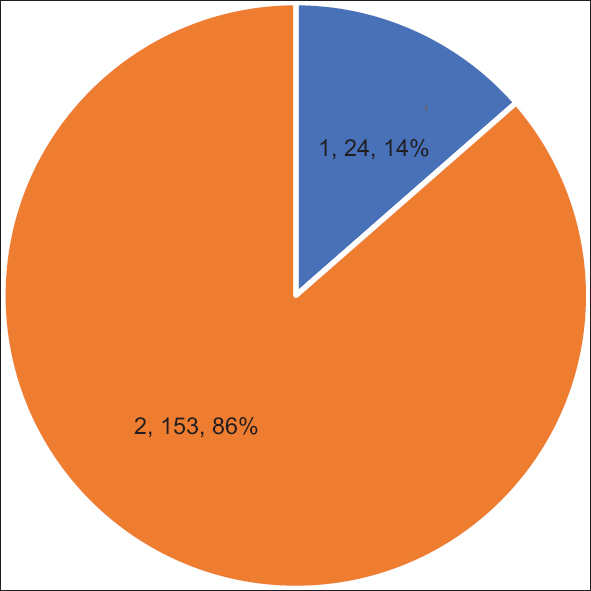 Between July 2015 and March 2016, consenting participants were purposively recruited from the first clinic attendance until the calculated sample size, 176, was achieved. The instrument used was an interviewer-administered questionnaire which was used to obtain information on demographic status, progress during and outcome of pregnancy. The participants' weight and height were recorded at the first clinic and used to calculate the (BMI; weight in kilograms divided by height in meters squared). 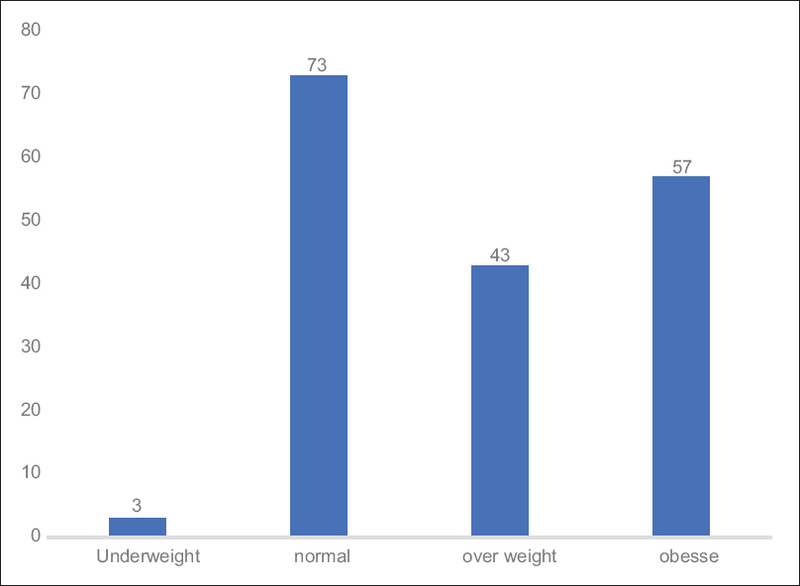 The World Health Organization classification of BMI (normal 18.5–24.9, overweight 25.0–29.9, and obese ≥30) was used to categorize the women into BMI groups. Gestational age at booking was calculated using the last menstrual period and early ultrasound scan. Other details obtained from the patients' records included the development of pregnancy complications such as pregnancy-induced hypertension (PIH) and gestational DM (GDM). Route of delivery, blood loss at delivery, gestational age at delivery, and neonatal outcomes such as birth weight and admission to the neonatal intensive care unit (NICU) as recorded in the patient records were also obtained. Data from the questionnaires were cleaned and analyzed using IBM SPSS Statistics for Windows, Version 20.0. (Armonk, NY: IBM Corp). Means and standard deviations were computed for continuous variables and proportions for categorical variables. The differences between the three categories of BMI were compared using Chi-square or ANOVA as necessary. The joint Institutional Ethical Review Board approved the study. A total of 176 consenting pregnant women who met the study criteria, were enrolled in the study and followed up till delivery. However, the result of 173 women with enough data for analysis is presented here. Using the early pregnancy weight, 24.3% and 32.2% were overweight or obese, respectively [Figure 1]. [Table 1] shows the characteristics of the women at booking. The mean age of the participants was 31.7 ± 4.4 years. The mean weight and BMI of the participants were 71.0 ± 15.2 kg and 27.1 ± 5.3 kg/m 2, respectively. On an average, the first antenatal clinic visit was at the gestational age of 14.4 ± 3.2 weeks. Most (91.3%) of the women had postsecondary education. The obese group was older and with a greater proportion of the women of high parity ≥2. The maternal weight (88.1 ± 10.0 kg) and BMI (33.34 kg/m 2) at booking were highest in the obese group of women. The differences were statistically significant (P = 0.00 and 0.00, respectively). Forty-one (22.0%) of the women experienced one or more pregnancy complications with 75 complications in total being observed [Table 2]. The most common pregnancy complications observed were malaria (10.4%), PIH (9.83%), and preeclampsia (11.0%). The obese women had the highest proportion (28.6%) of pregnancy complications. PIH and preeclampsia were most commonly seen in women who were overweight or obese. Obese women also had higher proportions of GDM (10.5%) and intrauterine growth restriction (7.0%) and had more antenatal admissions (28.1%). The obese women, compared with the overweight and normal weight, delivered at a lower (mean) gestational age (37.8 weeks ± 2.4 vs. 38.2 ± 1.9 vs. 38.4 ± 2.1). At delivery, the obese and overweight groups had more women delivering by cesarean section (39, 69.6% and 30, 69.7% respectively) and similarly had higher estimated blood loss at delivery (350.0 ml and 450.0 ml). Finally, the mean birth weight of the obese group was lower than that of the overweight and normal-weight women (3.0 ± 0.8 vs. 3.2 ± 0.6 vs. 3.1 ± 0.7 kg, respectively). 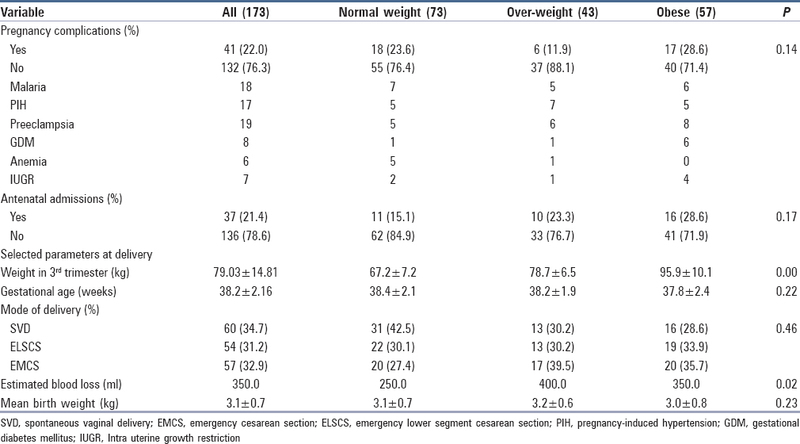 Neonatal outcomes [Table 3] revealed that the obese group of women had more women delivering before 37 completed weeks, had more babies born with low birth weight or macrosomia. Finally, they had more neonates requiring special care baby unit admission. Using the BMI in early pregnancy of this group of women, the prevalence of obesity in this study was 32.2% whereas 24.3% of the women were overweight. The prevalence of obesity noted in this study is higher than the prevalence of obesity reported by Callaway in Australia (13.5%), Ezeanochie et al. in Benin, Nigeria (9.63%) and Chigbu and Aja in Enugu, Nigeria (10.7%).,, It is, however, lower than the prevalence of 44.0% reported by Basu et al. in South Africa. This variation may be partly explained by differences in the criteria used in defining obesity in these studies, racial and environmental factors such as dietary influences. While some workers have opined that the high prevalence of poverty and infectious diseases like HIV in the African population reduce the impact of dietary influences as a risk factor for obesity, others have noted otherwise., For example, Chigbu and Aja noted that the staple food (mainly high fiber and complex carbohydrates) and the intense manual agricultural existence in most rural populations makes obesity less likely when compared to women in urban settings. Women in urban settings are more likely to consume processed foods and engage in more sedentary occupation. The study was conducted in an urban setting. This supports the age-long known weight-modifying factors, namely, dietary and physical activity pattern. Some authors have used the absolute weight of 90 kg and above as a measure of obesity in pregnancy. For example, in a study by Olayemi et al. also in Ibadan, where this criterion as a measure of obesity was used prevalence of 7.64% was reported. Using this criterion of absolute weight, we found 14% of the women to be obese [Figure 2]. It has been advocated that the use of prepregnancy BMI or the maternal BMI in early pregnancy are the more appropriate measurements to study the effect of maternal obesity on pregnancy.,, Maternal weight gain in the first trimester of pregnancy is negligible, and sometimes, there could be weight loss due to nausea and vomiting associated with early pregnancy. First-trimester maternal weight could thus be taken as a reasonable representation of maternal prepregnancy weight. In this study, the obese women were older and had higher parity, although the differences were not statistically significant. This is similar to the finding of Ezeanochie et al. who noted that age over 30 years and parity >1 were significant risk factors for obesity in early pregnancy. Similarly, increasing parity has been identified as a risk factor for maternal obesity by other workers., This can be explained by the fact that not all the weight gained in each pregnancy is lost after delivery and this cumulatively predisposes women with high parity and advancing maternal age to obesity. Indeed, in a study by Ezeanochie et al. where they studied obesity in pregnancy, they observed from the 2008 Nigerian Demographic Health Survey that the average Nigerian woman gives birth to 5.7 children by the end of her childbearing years. This was associated with a five-fold increase in the prevalence of obesity between women aged 15–19 years and 40–49 years at the end of their reproductive years. Because of this Ezeanochie et al. proposed effective family services to limit family size and as a proxy for reducing obesity in our environment. The obese and overweight women were more likely to deliver by cesarean section. Obesity in pregnancy has been recognized as a risk factor for cesarean delivery in previous studies.,,,,,,, Pregnancy in an obese woman can be considered a high-risk pregnancy which may be associated with increased incidence of other complications of pregnancy, as such the resort to interventional delivery including cesarean section by physicians may be higher to prevent morbidity or mortality either for the woman or her baby. The high-risk nature of obesity in pregnancy may also explain the finding of the infants of the obese women being more likely to be delivered preterm or to have abnormal birth weight, i.e., low birth weight or macrosomia. They also had a higher incident of admission to the NICU. While Ezeanochie et al. found no effect on preterm delivery, several authors have found increased risk factors for preterm delivery and increased birth weight.,,, The increased incidence of prematurity may explain the associated increase of low birth weight. Again, these adverse neonatal outcomes may not be unrelated to the association between obesity and adverse maternal outcomes such as PIH, preeclampsia, and GDM. This study has the limitation of the small sample size, and so extrapolation of the results to the general population requires some caution. In addition, it was conducted in a largely urban population who may differ markedly from rural dwellers. The need for more studies preferably multi-centered and involving rural dwellers has previously been identified and is even more necessary given the increasing trend of obesity globally. It, however, has the strength of the prospective collection of data and careful documentation and so overcoming the challenges of reviewing already collected data and case records which are often poorly documented. Given this, this study provides important data on the influence of maternal obesity in early pregnancy on pregnancy outcome in the African population and will hopefully serve to stimulate more research in this emerging area. Maternal obesity is considerable in our obstetric population and has the potential to contribute substantially to adverse materno-fetal outcome further stretching the limited health resources in this environment. This makes it imperative that stakeholders begin to develop specific guidelines on the management of obese pregnant women in this resource-poor setting. The authors would like to thank all the women who participated in this study and the staff of the antenatal clinic, University College Hospital, Ibadan. Callaway LK, Prins JB, Chang AM, McIntyre HD. The prevalence and impact of overweight and obesity in an Australian obstetric population. Med J Aust 2006;184:56-9. Kelly A, Kevany J, de Onis M, Shah PM. A WHO collaborative study of maternal anthropometry and pregnancy outcomes. Int J Gynaecol Obstet 1996;53:219-33. Fadupin GT, Pikuda YC. Maternal weight gain and pregnancy outcome in adolescent girls in Ibadan, Nigeria. Afr J Med Med Sci 2011;40:197-205. Iyoke CA, Ugwu GO, Ezugwu FO, Lawani OL, Onyebuchi AK. Retrospective cohort study of the effects of obesity in early pregnancy on maternal weight gain and obstetric outcomes in an obstetric population in Africa. Int J Womens Health 2013;5:501-7. Kandala NB, Stranges S. Geographic variation of overweight and obesity among women in Nigeria: A case for nutritional transition in sub-Saharan Africa. PLoS One 2014;9:e101103. Basu JK, Jeketera CM, Basu D. Obesity and its outcomes among pregnant South African women. Int J Gynaecol Obstet 2010;110:101-4. Gaillard R, Durmuş B, Hofman A, Mackenbach JP, Steegers EA, Jaddoe VW, et al. Risk factors and outcomes of maternal obesity and excessive weight gain during pregnancy. Obesity (Silver Spring) 2013;21:1046-55. Persson M, Johansson S, Villamor E, Cnattingius S. Maternal overweight and obesity and risks of severe birth-asphyxia-related complications in term infants: A population-based cohort study in Sweden. PLoS Med 2014;11:e1001648. Sebire NJ, Jolly M, Harris JP, Wadsworth J, Joffe M, Beard RW, et al. Maternal obesity and pregnancy outcome: A study of 287,213 pregnancies in London. Int J Obes Relat Metab Disord 2001;25:1175-82. Chigbu C, Aja L. Obesity in pregnancy in Southeast Nigeria. Ann Med Health Sci Res 2011;1:135-40. Catalano PM. Management of obesity in pregnancy. Obstet Gynecol 2007;109:419-33. Lu GC, Rouse DJ, DuBard M, Cliver S, Kimberlin D, Hauth JC, et al. The effect of the increasing prevalence of maternal obesity on perinatal morbidity. Am J Obstet Gynecol 2001;185:845-9. Satpathy HK, Fleming A, Frey D, Barsoom M, Satpathy C, Khandalavala J, et al. Maternal obesity and pregnancy. Postgrad Med 2008;120:E01-9. Rasmussen KM, Yaktine AL, editors. Weight Gain During Pregnancy: Reexamining the Guidelines. Washington, (DC): National Academies Press; 2009. Djrolo F, Megnigbeto Obey A, De Souza J, Takpara I, Santos P, Alihonou E, et al. Influence of maternal weight on pregnancy outcome in Cotonou (Benin). J Gynecol Obstet Biol Reprod (Paris) 2002;31:243-7. Obi SN, Obute EA. Pregnancy outcome in the obese Nigerian. Trop J Obstet Gynaecol 2004;21:32-5. Ezeanochie MC, Ande AB, Olagbuji BN. Maternal obesity in early pregnancy and subsequent pregnancy outcome in a Nigerian population. Afr J Reprod Health 2011;15:55-9. Kruger HS, Venter CS, Vorster HH, Margetts BM. Physical inactivity is the major determinant of obesity in black women in the North West province, South Africa: The THUSA study. Transition and health during urbanisation of South Africa. Nutrition 2002;18:422-7. Olayemi O, Umuerri O, Aimakhu CO. Obstetric Performance of Nigerian Obese Parturients. Trop J Obstet Gynaecol 2002;19:17-20. Abenhaim HA, Kinch RA, Morin L, Benjamin A, Usher R. Effect of prepregnancy body mass index categories on obstetrical and neonatal outcomes. Arch Gynecol Obstet 2007;275:39-43. Smith GC, Shah I, Pell JP, Crossley JA, Dobbie R. Maternal obesity in early pregnancy and risk of spontaneous and elective preterm deliveries: A retrospective cohort study. Am J Public Health 2007;97:157-62. Heslehurst N, Ells LJ, Simpson H, Batterham A, Wilkinson J, Summerbell CD, et al. Trends in maternal obesity incidence rates, demographic predictors, and health inequalities in 36,821 women over a 15-year period. BJOG 2007;114:187-94. Lee CY, Koren G. Maternal obesity: Effects on pregnancy and the role of pre-conception counselling. J Obstet Gynaecol 2010;30:101-6. Schrauwers C, Dekker G. Maternal and perinatal outcome in obese pregnant patients. J Matern Fetal Neonatal Med 2009;22:218-26. Body mass index; obesity; outcomes; pregnancy.